Learn to descend easy level canyons in an autonomous way, techniques for big vertical abseils or delicate whitewater movements safely. Dive in in the Canyon world with Patagonica! Our 2 day Canyon Training course is the best way to learn the techniques of this exciting sport in real terrain. 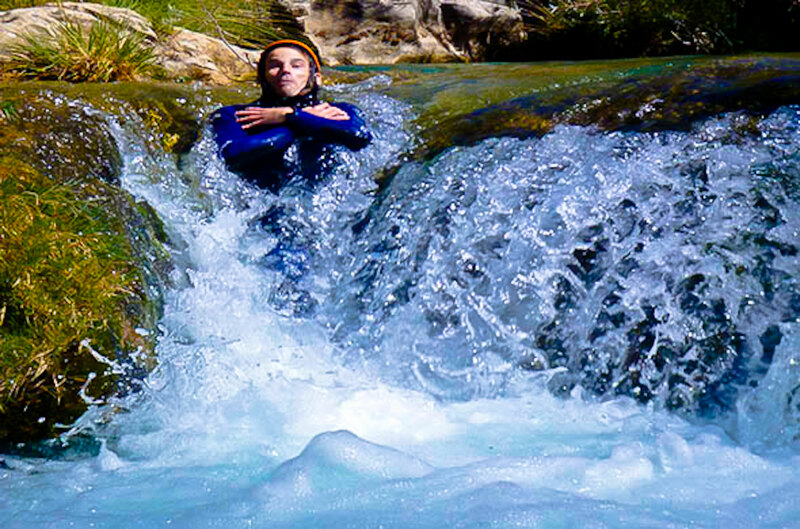 Acquires the right skills to become an independent canyoning adventurer with our experienced canyon instructors. 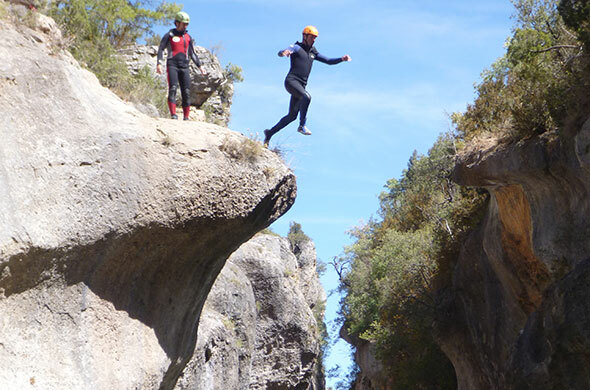 Abseiling techniques in a canyon environment. Intro canyon swimming and moving in water. Rig a simple retrievable canyon abseil up to 20m. All weekends. From May to September. Tight swimsuit to wear underneath your wetsuit (avoid shorts type). Suitable footwear that can get wet e.g. canyon shoes, approach shoes or running shoes. Wetsuit, harness, helmet and backpack canyoning If you have. Personal canyon gear: Harness, helmet. Group equipment: First aid kit, ropes, descenders, carabiners. Not included: Meals, drinks, transportation, accommodation (consult us). Swinsuit (groups < 3 participants). Acquires necessary techniques for more difficult canyons and with more commitment . 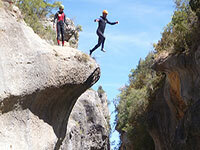 Large and vertical abseils, long descents, dangerous water movements. 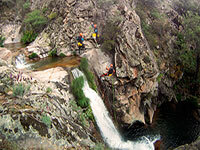 Previous abseiling and canyoning experience is a must. Review of contents of the first level. Abseiling advanced techniques: Chained, split, passing knots in abseiling. Selection and setting up anchors. Learn and practise the necessary techniques to move with confidence in swift waters and to understand how white waters in a flooded canyon behaves. Basic rescues through to underwater searches and extraction techniques, ideal for people planning on guiding inexperienced people, canyoning difficult gorges or exploration trips, this sort of training is a must! Water. Behavior of fluids in the environment of the canyons. Progression techniques in swift waters. Throw bagging from beginner to advanced. The flooding in the canyons, management and exits.